From treehouse chic to business efficiency—Airbnb is everything to all travelers. TO AIRBNB, OR NOT TO BE? That the modern lexicon attaches a nostalgic sheen to hosts using the platform as it was originally intended to be used is telling. These days Airbnb is regularly accused of being too “professionalized,” or riddled with commercially-motivated operators running informal hotels (some of them in compliance with city regulations, some very much not). These hosts rarely interact with guests, the critique goes, and are far from providing the ideal of a “live like a local” experience that Airbnb itself popularized. The professionalization of Airbnb is also implicated in making housing unaffordable for locals by encouraging landlords to rent homes to an endless parade of short-term guests, at higher rates than they could charge longer-term tenants. That the modern lexicon attaches a nostalgic sheen to hosts using the platform as it was originally intended to be used is telling. 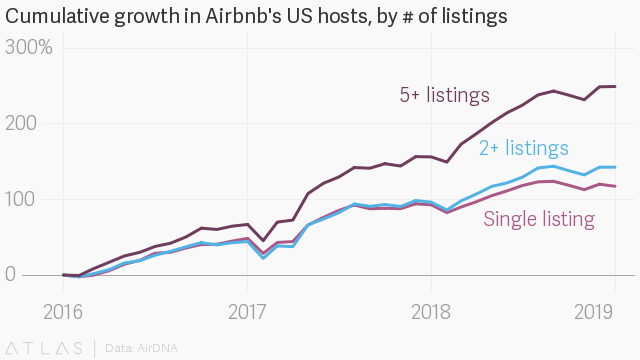 If Airbnb does IPO at a rumored value in the tens of billions of dollars, investors will presumably want solid answers on how much of Airbnb’s revenue is coming from people’s spare bedrooms. Airbnb itself did not respond to a question about whether increased regulation in cities around the world has been a driver of host professionalization. The company is engaged in what a recent Wired piece called “a city-by-city, block-by-block guerrilla war” when it comes to regulations around tax, zoning, and safety laws. Can you still belong anywhere? Even as Airbnb battles municipal regulations and is embroiled in lawsuits with cities across the world, it still seems keen to maintain the warm and fuzzy ethos of its early sharing economy days. In an email to Quartz, a spokesperson used the phrases “magical stays,” “community not commodities,” and “a world where anyone can belong anywhere” to describe the company’s mission. Airbnb’s woes fit into a broader context of the turbulent democratization of travel. Though Airbnb frequently draws attention to the sizable economic contribution it and the tourists it brings make to cities and tourism revenues around the world, the ongoing crisis of overtourism has proven that there is such a thing as too much of a good thing. While tourism revenues look good on paper, those figures don’t account for the hidden costs that some local residents have borne in service of that growth. It’s cool if your neighbors make extra cash from renting out their flat or local restaurants thrive by attracting out-of-towners—but not so cool that you have to hear trundling luggage, mistakenly-rung buzzers, and drunken house parties every night of the week. As it turns out, creating “a world where anyone can belong anywhere” is easier said than done.